Heirloom seed gardeners sow for the millenium, growing vegetables, fruits and herbs of the past. Cheap Scapes: Sensible gardeners insist money doesn't have to grow on trees in order to make trees grow. They Might Be Giants: The art and science of growing gargantuan gourds. Santa Rosa Media Access is realizing a dream of bringing increased public-access television to Santa Rosa. The Scoop: The death penalty is a sick joke on the Constitution. Brain Food: Giving burgers the grill. Free Bird: Possibly the last independent U.S. publisher., the prestigious Black Sparrow Press is run by John and Barbara Martin with only a handful of employees and the goodwill of nine office cats. Please don't forget to write! The Sonoma County Independent welcomes letters commenting on our coverage or other topics of local interest. Please keep all letters at 300 words or less (we reserve the right to edit them for length and style) and sign them (unsigned letters will not be published. A local phone number must be included for verification. 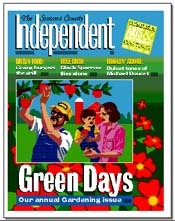 Postal: Sonoma County Independent Letters, 540 Mendocino Ave., Santa Rosa, CA 95401. Fax: 707/527-1288. Email: [email protected]. Emailers, please include name, city of residence and phone number. Letters printed will list email address unless otherwise specified. Letters to the editor are not currently published in the online version of this paper.